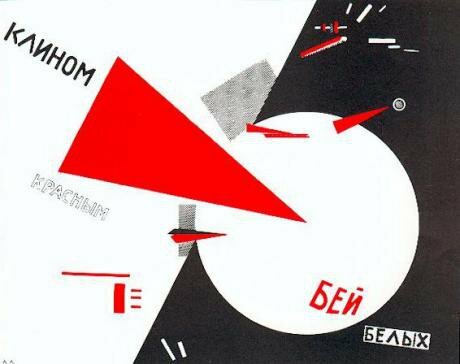 Beat the Whites with the Red Wedge (1919), by El Lissitzsky. Wikipedia / Public Domain.The Royal Academy’s new blockbuster show “Revolution: Russian Art 1917-1932” is a disorienting experience. Caught between bombastic propaganda — albeit made with irresistible avant-garde panache — and the works of great modernist painters like Chagall, Kandinsky or Malevich, one is never quite sure what the exhibition’s purpose is. Is it to showcase early Soviet art? Or to speak more broadly about modernist and avant-garde art in Russia in the years after the Revolution? Of course, for some of the artists presented, this distinction is meaningless. Russia’s avant-garde and the October Revolution went hand in hand. Yet the label we use to describe this art is a matter that goes beyond an artist’s ideological affiliation with the Soviet state. It may also be worth interrogating the use of the term “Russian”. One of the Royal Academy’s main attractions is a room full of paintings by Kazimir Malevich, an artist who made his name in Russia, but who was born to a Polish family in Ukraine — his parents would have known him as Kazimierz. Beyond the Black Square for which he’s famous, Malevich’s striking images of blank-faced peasants (1930-1932) depict, as the exhibition suggests, a class of people drained of their identity by ill-conceived and brutal Soviet agricultural policies. Malevich’s origins in Ukraine, which suffered the brunt of Soviet agricultural terror, culminating in millions dead in the Holodomor of 1932-33, is surely significant for understanding his preoccupation with the fate of Soviet peasants. 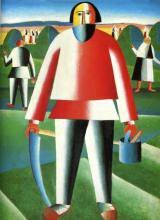 Mower (1930) by Kazimir Malevich. Wikipedia / Public Domain. Yet Malevich’s origins are not mentioned in the exhibition. In the room devoted to peasants, the mass casualties of Soviet policy are mentioned in a rather vague account of collectivisation, but Ukraine, the epicentre of this tragedy, is not. By way of explanation, the exhibition catalogue’s timeline euphemistically mentions a “famine crisis in Ukraine”. Peasants come up again in a later room, which pauses the revolutionary fervour to account for artists who expressed nostalgia for “eternal Russia”. This room is filled with paintings of domed churches and scenes from traditional rural life. The undoubted star attraction here is Marc Chagall’s Promenade (1917-1918). The painter, holding the hand of his floating wife Bella, stands in front of a small-town landscape: not “eternal Russia”, but Vitebsk in Belarus. And it comes from a time when Chagall was rediscovering the Jewish culture of his origins in the Pale of Settlement — hence the return to his native Vitebsk. The Jewish and Belarusian dimensions here are subsumed under a general longing for “eternal Russia”. Chagall’s Jewish identity and Belarusian connections are relatively well known. But there are many less famous artists here who are not straightforwardly Russian, and whose origins are entirely ignored. One of the most striking images of all is Kliment (or Klyment) Redko’s 1925 “Insurrection”, a startling geometric composition showing all the leading Bolsheviks alongside their foot soldiers in a fiery urban landscape. The image owes as much to the avant-garde as it does to Redko’s training as an icon painter in his native Ukraine (he was, in fact, born in what is now Poland). A case analogous with Chagall is that of Dziga Vertov, whose films are shown in the first room of the exhibition. Vertov was born David Kaufman to a Jewish family in Bialystok, and did some of his most important work in Ukraine. Vertov’s Man with a Movie Camera (1929), shot largely in Odessa, Kharkiv and Kyiv (and also in Moscow), and shown here, is one of the most influential in world cinema. His Enthusiasm: Symphony of the Donbas, which depicts the industrialisation of that region, is displayed here alongside a remarkable poster by Aleksandr Deineka (a Russian artist who was trained in Ukraine and features prominently throughout the exhibition) on the same topic. These works have powerful resonances for events in that region today, providing insight into the Donbas’s still-powerful sense of proletarian identity. But once again, the Ukrainian context is largely ignored. Dziga Vertov's Enthusiasm, or Symphony of the Donbas (1931). There is one point in the exhibition where a non-Russian artist is identified. The Ukrainian film director Oleskandr Dovzhenko is described as “Ukrainian-born”. Why Dovzhenko, who was not only born in Ukraine, but thought of himself as Ukrainian, made films about Ukraine, and worked extensively in Ukraine, should not be described simply a “Ukrainian” is unclear. It reminds one of the traditional Russian (and also western) view of Dovzhenko’s countryman, Nikolai Gogol: Gogol’s early works (which are all about Ukraine) are seen as juvenilia, a prelude to his proper, more serious work (which is about Russia). The most concerning instance of nationalisation of the non-Russian as Russian, however, comes at the end of the exhibition, and is not related directly to art. Until this point in the show, the fact that the Soviet Union put extreme pressure on, and eventually murdered its artists on a mass scale, is barely hinted at. But as you exit the show a small, dark “room of memory” displays prison photographs of ordinary people and cultural figures who ended up in prison or were executed by the Soviet regime. On the wall outside we are told that “millions of Russians died at the hands of Stalin’s brutal regime”. This statement is true: Soviet Russian citizens suffered terribly under Stalin. But it is only part of the story. The Soviet Union was a vast, multinational empire, and the victims of its crimes were not only Russian. Of course, Russians made up the largest group numerically, but they were proportionally less likely to fall victim to Soviet oppression than some other national groups: for Stalin, after all, there was little distinction between the class category of kulak — the main target of his devastating collectivisation policies ‘ and the national category of Ukrainian, while others, like Chechens or Crimean Tatars, were also specifically targeted. It may seem that accuracy over the identities of war dead or the victims of Soviet executions is different from accuracy over the identities of artists, and that these issues should not be conflated. Unfortunately, many of those artists became the victims of executions. And often precisely because of their nationality. Ukraine’s own avant-garde movement (which could do with its own exhibition in the RA some day) was completely devastated by Stalin in the 1930s to a large extent because it was a self-consciously Ukrainian movement. There is more to this question, then, than nitpicking over the arguably inconsequential factors of national identity or place of birth. But this is not only a question of historical importance. Being able to claim a great artist as the heritage of your nation, and thus of your state, is no trivial matter. It affords great soft-power possibilities. The Russian state is acutely aware of this, and it has consistently used it as a counterbalance to its aggressive foreign policies and oppressive domestic ones. (One need only think of the enormous lengths taken to arrange the spectacle of Valery Gergiev conducting the Mariinsky orchestra at Palmyra as evidence). Allowing the Russian Federation to claim as many great artists and writers as possible simply helps it build up its ammunition stocks in the soft-power war. May 2016: Valery Gergiev leads the Mariinsky Theatre Orchestra in Palmyra, Syria. Source: RT. It is not only in the field of art, or culture, that this question matters. More important is the misuse of the term Russian in other historical contexts, and most notably that of the Second World War. It is common to hear western journalists, academics and politicians speak of “Russia” defeating Hitler, of the huge numbers of Russians who died in the war. Russians did sacrifice a great deal in the war. As did Ukrainians, Belarusians and many others as part of the Soviet war effort. There were millions of non-Russians in the Soviet armed forces, while non-Russian civilians, in Ukraine and Belarus, which were both entirely occupied by the Nazis, suffered proportionally more heavily. This latter question matters because misdesignating millions of soviet war dead as Russian not only annuls the wartime experience of other groups. It also allows the contemporary Russian state to stack up its tally of sacrifices, bolstering its claim to the international moral high ground as heir to the Soviet Union’s title as defeater of fascism in Europe. This is crucial because this very myth, of the great Russian victory over (European!) fascism is at the heart of Putin’s rhetoric of rebuilding a Greater Russia. The nationalising frame of the Royal Academy exhibition is symptomatic of the fact that in the UK, and throughout the west, Russia and the Soviet Union are still, for many, synonymous. Why this simplification should be so common and even find its way into the work of major cultural institutions is puzzling. Perhaps it is the inherently imperial orientation of the British worldview: the agents of history are the great powers, and those small, peculiar nations “of whom we know nothing”, as one British statesman once put it, fall between the geopolitical and geocultural cracks. You’d be forgiven for thinking that in Britain today we would be able to deal with a bit of post-imperial nuance. If we transfer the dynamics of the presentation of “Russian art” in the RA’s exhibition to our own context, its problematic nature becomes clearer. Let’s imagine a major exhibition of modernist art form the British Isles that encompassed artists not only from England, but also from Scotland, Wales and Ireland, perhaps even some from the distant colonies (after all, many artists from the “peripheral” states made their way to London to further their careers). And let’s imagine, for a moment, that the Irish Potato Famine had occurred not in the mid-19th century, but in the early 1930s. Then let’s imagine that Ireland is not mentioned in a room containing art that dealt with the fate of the peasantry in the British Isles, and neither is the background of the most prominent artist in the room, who is an Ulster Scot. And finally, let’s imagine that the exhibition is called “English Modernist Art”. It would never happen. If it did, this kind of oversight would no doubt ruffle some feathers in political debates, though they would remain largely a question for cultural critics and academics to quarrel over. It would not be a matter of life and death. In the case of Russia today, which wastes no expense or effort in mobilising cultural resources for soft-power purposes, and capitalises on simplified, nationalised interpretations of complex, multinational histories to justify very real wars, the question of accuracy becomes slightly more urgent.